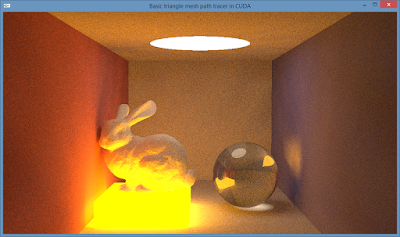 While the tutorial from the previous post was about path tracing simple scenes made of spheres, this tutorial will focus on how to build a very simple path tracer with support for loading and rendering triangle meshes. Instead of rendering the entire image in the background and saving it to a file as was done in the last tutorial, this path tracer displays an interactive viewport which shows progressively rendered updates. This way we can see the rendered image from the first pass and watch it converge to a noise free result (which can take some time in the case of path tracing triangle meshes without using acceleration structures). For this tutorial I decided to modify the code of a real-time CUDA ray tracer developed by Peter Trier from the Alexandra Institute in 2009 (described in this blog post), because it's very compact, does not use any external libraries (except for CUDA-OpenGL interoperability) and provides a simple obj loader for triangle meshes. 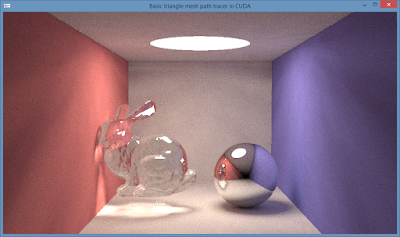 I modified the ray tracing kernel to handle path tracing (without recursion) using the path tracing code from the previous tutorial, added support for perfectly reflective and refractive materials (like glass) based on the code of smallpt. The random number generator from the previous post has been replaced with CUDA's own random number generation library provided by curand(), which is less prone to patterns at low sample rates and has more uniform distribution properties. The seed calculation is based on a trick described in a post on RichieSam's blog. The code is one big CUDA file with lots of comments and can be found on my Github repository. 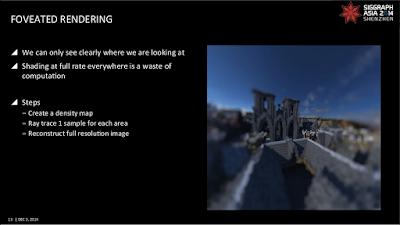 - triangle data is stored in the GPU's texture memory which is cached and is a bit faster than global memory because fetching data from textures is accelerated in hardware. The texture cache is also optimized for 2D spatial locality, so threads that access addresses in texture memory that are close together in 2D will achieve best performance. 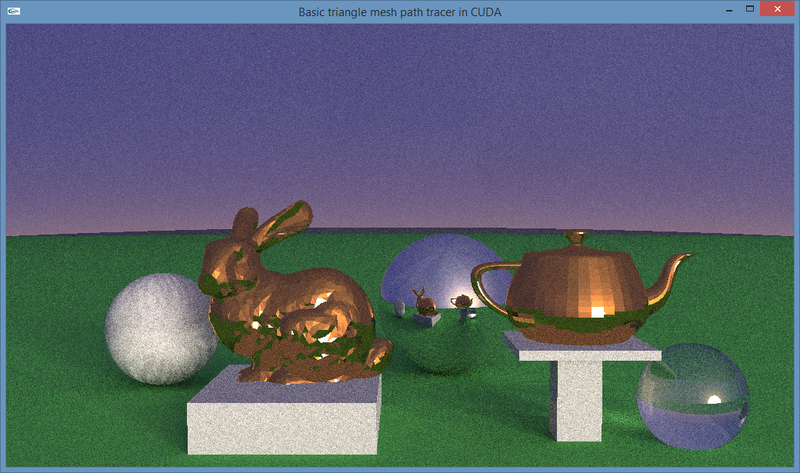 - to speed up the ray tracing an axis aligned bounding box is created around the triangle mesh. Only rays hitting this box are intersected with the mesh. Without this box, all rays would have to be tested against every triangle for intersection, which is unbearably slow. In the next tutorial, we'll have a look at implementing an acceleration structure, which speeds up the rendering by several orders of magnitude. 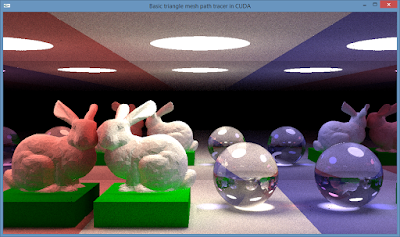 This blog post provides a good overview of the most recent research in ray tracing acceleration structures for the GPU. 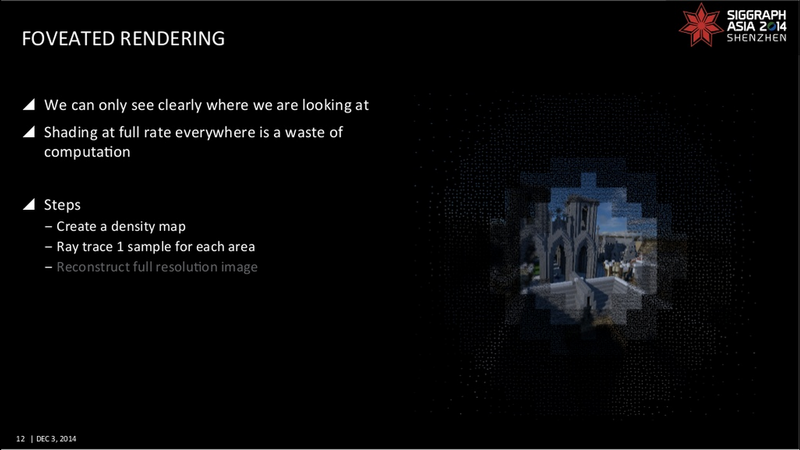 There will also be an interactive camera to allow real-time navigation through the scene with depth of field and supersampled anti-aliasing (and there are still lots of optimisations). 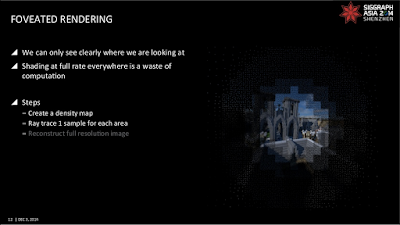 More details can be found at http://developer.amd.com/tools-and-sdks/graphics-development/firepro-sdk/firerays-sdk/. The acceleration structure is a BVH with spatial splits and the option to build the BVH with or without the surface area heuristic (SAH). For instances and motion blur, a two level BVH is used, which enables very efficient object transformations (translation, rotation, scaling) at virtually no cost. 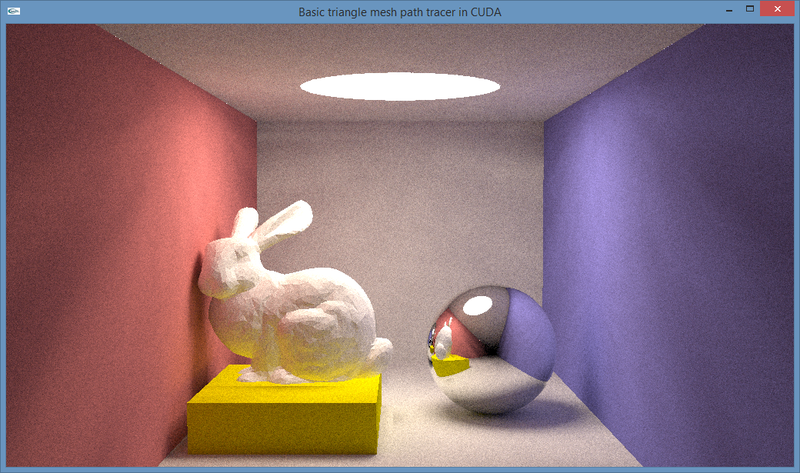 There are already a few OpenCL based path tracers available today such as Blender's Cycles engine and LuxRays (even V-Ray RT GPU was OpenCL based at some point), but none of them have been able to challenge their CUDA based GPU rendering brethren. AMD's OpenCL dev tools have historically been lagging behind Nvidia's CUDA SDK tools which made compiling large and complex OpenCL kernels a nightmare (splitting the megakernel in smaller parts was the only option). 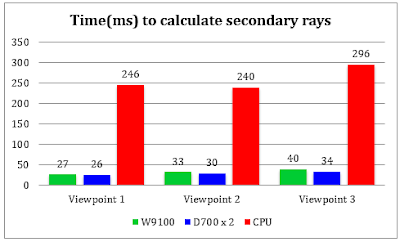 Hopefully the OpenCL developer tools have gotten a makeover as well with the release of this SDK, but at least I'm happy to see AMD taking GPU ray tracing serious. This move could truly bring superfast GPU rendering to the masses and with the two big GPU vendors in the ray tracing race, there will hopefully be more ray tracing specific hardware improvements in future GPU architectures. 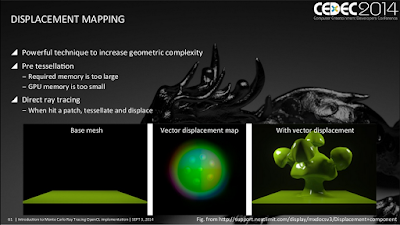 UPDATE: Alex Evans from Media Molecule had a great talk at Siggraph 2015 about his research into raymarching signed distance fields for Dreams. 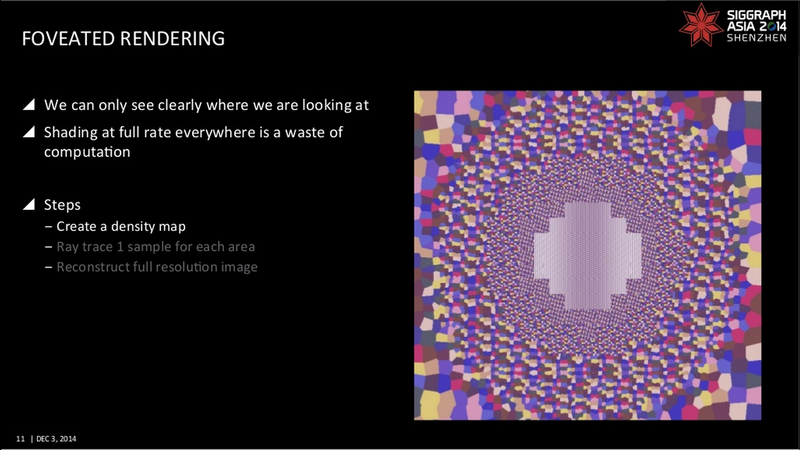 Alex Evans is currently probably the biggest innovator in real-time game rendering since John Carmack (especially since Carmack spends all his time on VR now, which is a real shame). Alex's presentation can be downloaded from http://www.mediamolecule.com/blog/article/siggraph_2015 and is well worth reading. 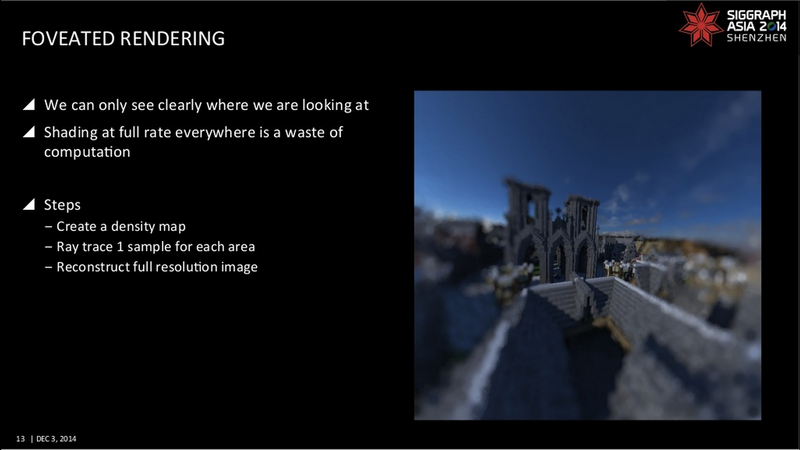 It sums up a bunch of approaches to rendering voxels, signed distance fields and global illumination in real-time that ultimately were not as successful as hoped, but they came very close to real-time on the PS4 (and research is still ongoing). A very interesting paper called "Gradient domain path tracing" was just published by Nvidia researchers (coming from the same incredibly talented Helsinki university research group as Timo Aila, Samuli Laine and Tero Karras who developed highly optimized open source CUDA ray tracing kernels for Tesla, Fermi and Kepler GPUs), describing a new technique derived from the ideas in the paper Gradient domain Metropolis Light Transport, which drastically reduces noise without blurring details. We introduce gradient-domain rendering for Monte Carlo image synthesis. While previous gradient-domain Metropolis Light Transport sought to distribute more samples in areas of high gradients, we show, in contrast, that estimating image gradients is also possible using standard (non-Metropolis) Monte Carlo algorithms, and furthermore, that even without changing the sample distribution, this often leads to significant error reduction. This broadens the applicability of gradient rendering considerably. To gain insight into the conditions under which gradient-domain sampling is beneficial, we present a frequency analysis that compares Monte Carlo sampling of gradients followed by Poisson reconstruction to traditional Monte Carlo sampling. 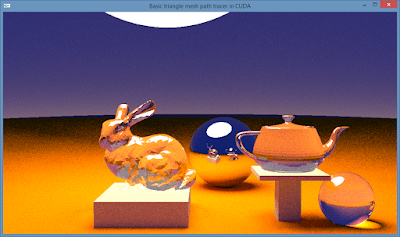 Finally, we describe Gradient-Domain Path Tracing (G-PT), a relatively simple modification of the standard path tracing algorithm that can yield far superior results. Physically correct rendering of environment illumination has been a long-standing challenge in interactive graphics, since Monte-Carlo ray-tracing requires thousands of rays per pixel. 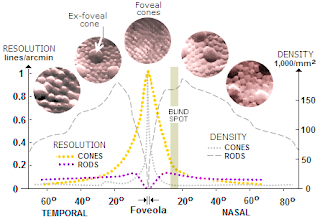 We propose accurate filtering of a noisy Monte-Carlo image using Fourier analysis. Our novel analysis extends previous works by showing that the shape of illumination spectra is not always a line or wedge, as in previous approximations, but rather an ellipsoid. Our primary contribution is an axis-aligned filtering scheme that preserves the frequency content of the illumination. We also propose a novel application of our technique to mixed reality scenes, in which virtual objects are inserted into a real video stream so as to become indistinguishable from the real objects. 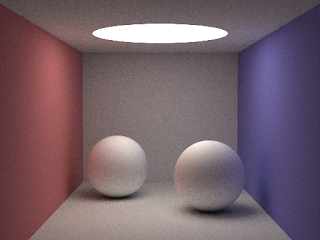 The virtual objects must be shaded with the real lighting conditions, and the mutual illumination between real and virtual objects must also be determined. 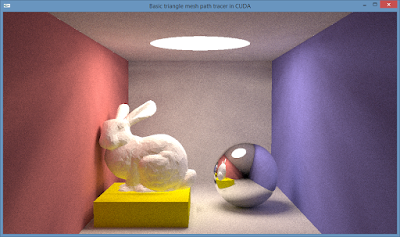 For this, we demonstrate a novel two-mode path tracing approach that allows ray-tracing a scene with image-based real geometry and mesh-based virtual geometry. Finally, we are able to de-noise a sparsely sampled image and render physically correct mixed reality scenes at over 5 fps on the GPU. 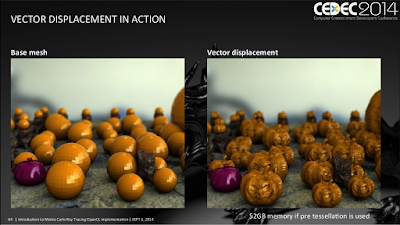 While Nvidia is certainly at the forefront of GPU path tracing research (with CUDA), AMD has recently begun venturing into GPU rendering as well and has previewed its own OpenCL based path tracer at the Siggraph 2014 conference. The path tracer is developed by Takahiro Harada, who is a bit of an OpenCL rendering genius. 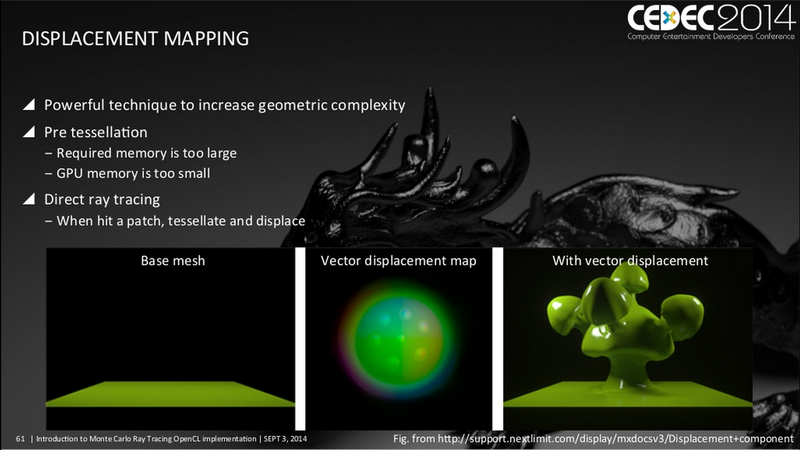 He recently published an article in GPU Pro 6 about rendering on-the-fly vector displacement mapping with OpenCL based GPU path tracing. Vector displacement mapping differs from regular displacement mapping in that it allows the extrusion of overlapping geometry (eg a mushroom), which is not possible with the heightfield-like displacement provided by traditional displacement (the Renderman vector displacement documentation explains this nicely with pictures). 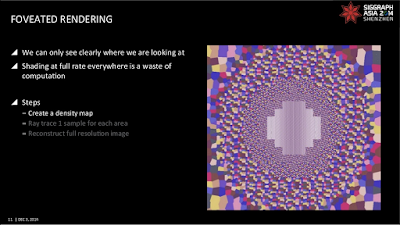 There's more info on Takahiro's personal page, along with some really interesting slideshow presentations about OpenCL based ray tracing. This guy also developed a new technique called "Foveated real-time ray tracing for virtual reality devices" (paper), progressively focusing more samples on the parts in the image where the eyes are looking (determined by eye/pupil tracking), "reducing the number of pixels to shade by 1/20, achieving 75 fps while preserving the same visual quality" (source: http://research.lighttransport.com/foveated-real-time-ray-tracing-for-virtual-reality-headset/asset/abstract.pdf). 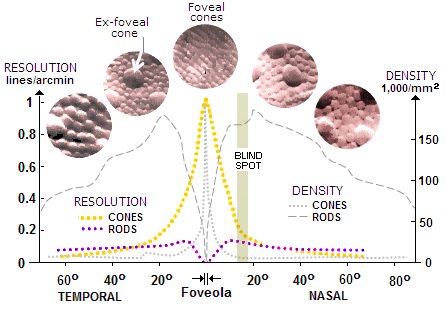 Foveated rendering takes advantage of the fact that the human retina is most sensitive in its center (the "fovea", which contains densely packed colour sensitive cones) where objects' contours and colours are sharply observed, while the periphery of the retina consists mostly of sparsely distributed, colour insensitive rods, which cause objects in the periphery of the visual field to be represented by the brain as blurry blobs (although we do not consciously perceive it like that, thinking that our entire visual field is sharply defined and has colour). Foveated rendering has the potential to make high quality real-time raytraced imagery feasible on VR headsets that support eye tracking like the recently Kickstarted FOVE VR headset. 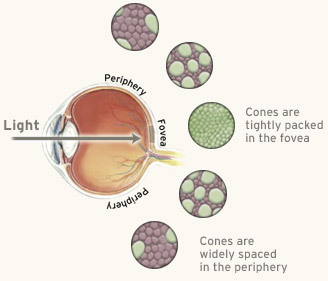 Using ray tracing for foveated rendering is also much more efficient than using rasterisation: ray tracing allows for sparse loading and sampling of the scene geometry in the periphery of the visual field, while rasterisation needs to load and project all geometry in the viewplane, whether it's sampled or not. It's good to finally see AMD stepping up its OpenCL game with its own GPU path tracer. 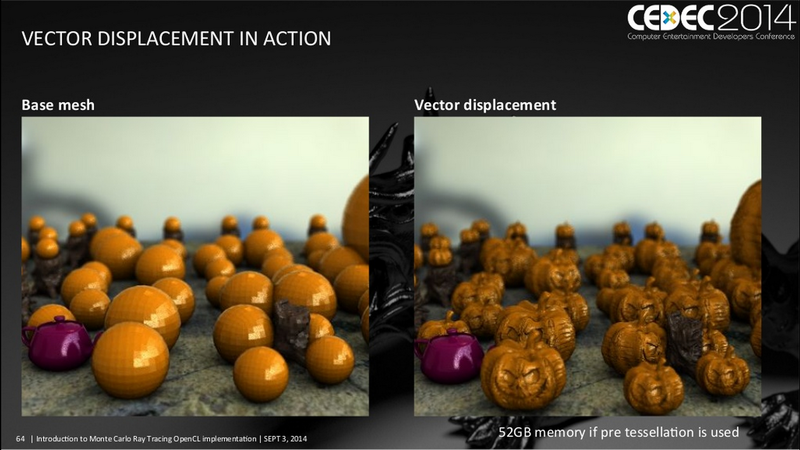 Another example of this greater engagement is that AMD recently released a large patch to fix the OpenCL performance of Blender's Cycles renderer on AMD cards. Hopefully it will put some pressure on Nvidia and make GPU rendering as exciting as in 2010 with the release of the Fermi GPU, a GPGPU computing monster which effectively doubled the CUDA ray tracing performance compared to the previous generation. Rendering stuff aside, today is a very important day: for the first time in their 115 year long existence, the Buffalo's from AA Gent, my hometown's football team, have won the title in the Belgian Premier League, giving them a direct ticket to the Champions League. This calls for a proper celebration! With last month's unveiling of Microsoft's augmented reality glasses project dubbed "HoloLens", today's announcement of Sony's plans to release a similar AR device called the "SmartEyeGlass", and with more details surfacing on Magic Leap's retina projecting fiber optic AR glasses (cleverly reconstructed from publicly available patents by a Gizmodo journalist), the hype around augmented reality seems to be reaching a peak at the moment. Unfortunately, most of the use cases for these technologies that have been demonstrated so far, for example husbands assisting their wives with screwing a new syphon on a sink, projecting the weather forecast for Maui on the kitchen wall or casually investigating a suspicious rock on the surface of Mars, look either gimmicky, far-fetched or both. The area where I see a real and immediate use for these high tech AR devices is in the operating room. In my previous life as a medical student, I've spent quite some time in the operating theatre watching surgeons frantically checking if they were cutting the right part of the brain by placing a sharp needle-like pointer (with motion capture dots) on or inside the brain of the patient. 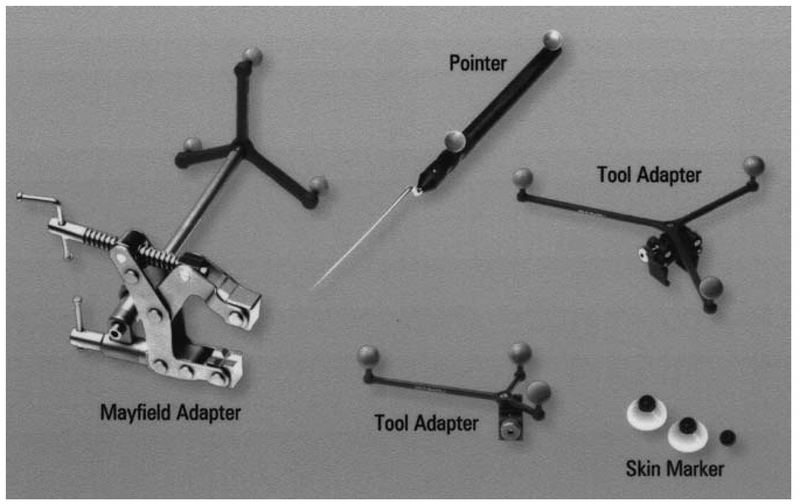 The position of the pointer was picked up by 3 infrared cameras and a monitor showed the position of the needle tip in real-time on three 2D views (front, top and side) of the brain reconstructed from CT or MRI scans. This 3D navigation technique is called stereotactic neurosurgery and is an invaluable tool to guide neurosurgical interventions. While I was amazed at the accuracy and usefulness of this high tech procedure, I was also imagining ways to improve it, because every time the surgeon checks the position of the pointer on the monitor, he or she loses visual contact with the operating field and "blindly" guiding instruments inside the body is not recommended. A real-time three-dimensional augmented reality overlay that can be viewed from any angle, showing the relative position of the organs of interest (which might be partially or fully covered by other organs and tissues like skin, muscle, fat or bone) would be tremendously helpful provided that the AR display device minimally interferes with the surgical intervention and the augmented 3D images are of such a quality that they seamlessly blend with the real world. The recently announced wearable AR glasses by MS, Sony and Magic Leap seem to take care of the former, but for the latter there is no readily available solution yet. This is where I think real-time ray tracing will play a major role: ray tracing is the highest quality method to visualise medical volumetric data reconstructed from CT and MRI scans. It's actually possible to extend a volume ray caster with physically accurate lighting (soft shadows, ambient occlusion and indirect lighting) to add visual depth cues and have it running in real-time on a machine with multiple high end GPUs. The results are frighteningly realistic. I for one can't wait to test it with one of these magical glasses. - smallpt from Kevin Beason: an impressively tiny path tracer in 100 lines of C++ code. Make sure to read David Cline's slides which explain the background details of this marvel.